In March 2000, within days of U.S. sonar exercises off the coast of the Bahamas, 17 deep-diving beaked whales beached themselves on the island sand, and seven of them died there of heatstroke. Two years later in the Canary Islands, shortly after international military exercises in the Atlantic, 14 beaked whales washed ashore and died. Though the strandings occurred miles and years apart, they both occurred within days of local sonar activity by military groups. Whale biologists worldwide, some funded by the U.S. Navy, have since been sniffing out a link between the ominous whale beachings and the sonar that seemed to have somehow triggered their odd behavior. In two papers published in the Wednesday issue of the Royal Society journals, an international team of scientists report the first behavioral changes observed in endangered blue whales and beaching-prone beaked whales in 2010 and 2011, when they were played simulated low-intensity sonar-like sounds, even at levels below those permitted and used today. Seventeen blue whales, which feed on a shrimp-like crustacean called krill, and two beaked whales, deep-divers which can be picked out by their unique beaked snout, were tagged with sensors and observed while sonar-like sounds were played at them from a distance, at slowly increasing volumes. The seventeen blue whales put up a varied response. Some of them stopped feeding, others swam away from the sound, and still others started swimming faster. "If they have to spend more time traveling and less time feeding, that could pose a risk to the population," Peter Tyack, a professor of biology and whale researcher at the University of St. Andrews in Scotland, told NBC News. Tyack is co-author on both papers. The two beaked whales were played back sonar-like sound with increasing frequency over the course of a half-hour. At levels below those used for military exercises, Tyack and team report, the whales stopped flipping their tails out of the surface of the water — a common movement known as fluking — stopped feeding and dived longer. The whales seemed to be responding to two factors: The intensity of the sound — how "loud" it appeared to be — as well as how far away it was coming from. Tyack explained that a combination of the two factors is what the whales ultimately respond to, but both species responded to sounds at levels lower than those allowed by regulations today. Bob Gisiner, of the Navy's Marine Mammal Commission that funded the research, told NBC News that he sees these results as a work-in-progress to better understand how marine mammals respond to noises of any kind. As part of the Navy's PCAD program (which stands for Population Consequences of Acoustic Disturbance), other projects are investigating beaked whale responses in the Bahamas and in Hawaii, humpback whales near Australia and sperm whales near Norway, he told NBC News. While he looks forward to more results in the coming years, "To me, the story hasn't been written yet," he said. That's because taking a lab experiment, which involves playing back sonar-like sounds to whales and then observing their behavior "in the ocean where the experiment takes place in thousands of square miles — that's a hard thing to do," Gisiner said. Part of the reason the whales haven't been studied before is because the tagging technique has been developed in the last few years — it involves leaning out of a boat with a long pole and attaching a tag onto a moving whale, and tracking their movement as they dive out of sight. "The tagging technique gave us much more power to monitor what the whales were doing," Tyack told NBC News. He and a group of researchers described the tagging technique for the first time in 2011. Together, the new twin reports hint that sonar may be having a population-wide impact on many species, not just marine communities which are accidentally wandering into testing waters like the beaked whales, Tyack said. While it was important to study beaked whales because of their extreme response to sonar, the blue whales were equally illuminative because they showed a comparatively more subtle group response in a species which scientists had guessed wouldn't have been affected. For now, Tyack says the team has demonstrated that they have a way to observe population-wide effects to man-made sounds. 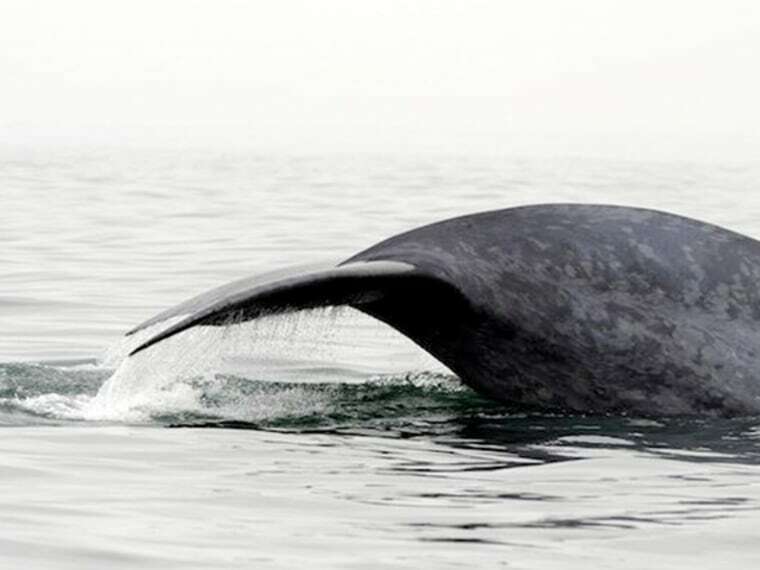 The initial results from blue whales suggest that there are other species that may be affected by man-made sounds including sonar, in ways that have not yet been observed. In addition to Peter Tyack, the authors of "Blue whales respond to simulated mid-frequency military sonar" include Jeremy Goldbogen, Brandon Southall, Stacy DeRuiter, John Calambokidis, Ari Friedlaender, Elliott Hazen, Erin Falcone, GregorySchorr, Annie Douglass, David Moretti, Chris Kyburg and Megan McKenna. Also, the authors of "First direct measurements of behavioral responses by Cuvier’s beaked whales to mid-frequency active sonar" include Stacy DeRuiter, Brandon L. Southall, John Calambokidis, Walter Zimmer, Dinara Sadykova, Erin Falcone, Ari Friedlaender, John Joseph, David Moretti, Gregory Schorr, Len Thomas and Peter Tyack. This article was corrected on July 12 to reflect that the whale strandings in the Bahamas took place in March 2000 and not November 2000.